You may have noticed a few KAL buttons over there on the right. When I joined them I swore that I wouldn’t join any more until I successfully completed one of them. And if I asked for a vote back in May of which one I was most likely to succeed in, I bet most of you would have guessed the socks. While it still has a fighting chance (2 months to go, and Trekking prefers a basic pattern so they would knit up fast, and I have several balls of it in the stash so no problems there). So anyway, it’s the Summer of Stash! People, I haven’t bought a single ball of yarn since a week before Memorial Day! The best part? I’m feeling strong enough to make it at least another month without withdrawal. Now, the genius part of this KAL is that you can list 2 exceptions. It’s like the bonus points on Weight Watchers. Sanctioned cheating so you don’t give up. I told myself that I could buy for anything I’m designing because I can’t force a pattern to fit the yarn if a certain design inspires me. 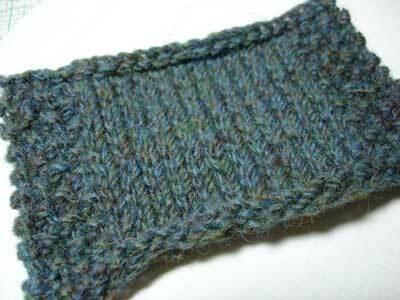 This weekend, I wasn’t sure what I’d do that cabled swatch in…so I remembered the Bemidji. Perfect! Great gauge and great color choice for checking out all the cable lines. I bought it a year and a half ago, so renewing interest in an older yarn is a great feat. But, I didn’t want a cream colored sweater. It just wasn’t what I had envisioned. And then it hit me…I had the PEFECT yarn! Black Water Abbey in Moss. Moss does not accurately describe this color AT ALL. It has a mossy overall hue, but there are bits of blue and teal and yellow. It’s a gorgeous, complex color, and I loved it from the moment I got the color card. I thought it would be my perfect St. Brigid but it wasn’t meant to be. The gauge just didn’t work out and the restulting fabric wasn’t pleasant and light. Mary Beth* tried to warn me but I had to find out myself. So, this BWA yarn — what could be more perfect than designing for it? I get to pick the exact gauge I like for the yarn, and let the sweater grow from there. I have all the cables mapped out, and I’ve decided on a finished garment size (I sized up because I think this should be a looser fitting sweater…I’m a little nervous about that). *MB: i’m sure you’re having a fantastic summer and enjoying the lack of the blog haunting for you to post, but i miss ya! ** i say to keep it interesting but it’s really for motivation. since i’m pretty excited about this one, this will encourage me to knit knit knit so i can see how it progresses and share it with all of you! not showing you the sketch right now also gives me some more creative freedom to change my mind as i knit. i’m interested in seeing how closely i end up following the sketch, and i’ll definitely post a pic of it when i’m done. I have just ordered the small one ounce yarn from Black Water Abbey. I’m interested in just how well it works. I have been swatching Berroco Ultra Alpaca in a funny green, I think it is saying cables, and not to believe the gauge of 5 stitches per inch, more like 5.5. Really nice stuff to work with, good yardage (213 yards?) and 50% alpaca 50% wool. I thought the wool would make it more springy but it hasn’t and this is one yarn where the color really does affect the yarn. I am interested to see the cable sweater. Moss is one of my favorite colors, too, and one I definitely plan to do something with. So far, the only BWA I’ve used was for my Celtic Dreams, but it was a pleasure to knit and I love the results, and darn it, there are so many other, pretty colors on that color card! I entirely agree. Moss deserves it’s very own sweater! 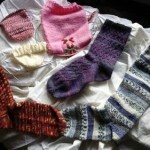 I’m glad you are succeeding in Summer of Stash. It has been a freeing exercise for me too, although I think a visit to the sheep farm today might be one of my exceptions! That yarn is incredibly gorgeous! Love it. 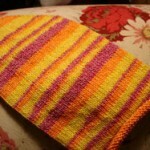 St. Brigid KAL…I am a bit of a failure there too. oh that IS a beautiful color. great choice! i know what you mean about designing. i’m picking out my yarns for a design as well! Go you for designing *and* not buying any more yarn! Now that’s resourceful! You are so sweet! I’m nearing the end of my blog sabatical (doesn’t that sound sophisticated? did I spell it right? )…I feel a post coming on soon…You know how I feel about BWA Moss – I’ll be watching yours unfold! Cables are going to be beautiful with that yarn. Wow. I really like that color. It’s very much right up my alley (so much so that I have to prevent myself from buying more blues and greens just for varieties’ sake) and I love the way it knits up. You’ve piqued my interest and I’ll definetly be back to see what you creat with it. Congrats on your Summer of Stash success!!! Always with the secrets…tsk, tsk. Love the rich color(s). Can’t wait to see the progress. Hurry up! *Beautiful* color! I’m so excited to hear about your progress. Cables, eek! I love them. Can’t wait to see it start to materialize! Especially if you’re using such complex cables as the one below. I love the deep color of the yarn, too! i am in love with Black Water Abbey. Their yarns are some of the most beautiful around and the pallette is unmatched. GREAT choice! 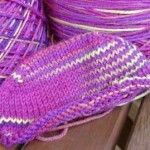 Love love love BWA yarns – those colors are so subtle and fabulous. Can’t wait to see the designs. But what if it ruins my stash reduction goals?